What do you get if you mix Buñuel, French theatre and outstanding charges preventing you from filming in the USA? The answer is Carnage. Based on the translation of the play Le Dieu du Carnage by Yasmina Reza, Polanski’s adaptation follows two couples – Alan and Nancy Cowan and Michael and Penelope Longstreet – as they meet to discuss a fight that took place between their sons. The fight leaves the Longstreets’ son with a bruised face and two missing teeth and the subsequent discussion is where we jump in. Reza’s play is a sort of apartment-bound Lord of the Flies. We see what happens as the veneer starts to rub off and the manners are replaced by honesty. Numerous attempts to leave the apartment prove fruitless, and leave us feeling claustrophobic as the adults slowly regress to childishness themselves. As you would expect for a four-hander, the cast is very strong. Foster is suitabley smackable as the new-agey, painfully liberal mother who fanatically pursues justice. Reilly is likeable in a throwaway way, with less under the top layer than the rest of the cast. Winslet brings her trademark excellence to the repressed Nancy. Wait. Stop that man! He’s stealing the show!! 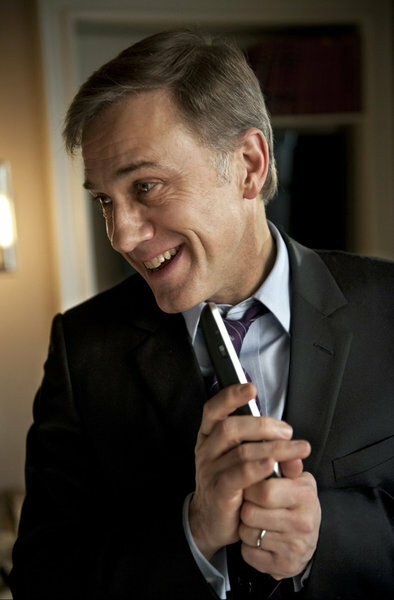 Yes, Christoph Waltz, bundles this movie into a bag and robs it out from the rest of the cast. His Alan is loveable, loathable, hilarious, hysterical and aloof and give the man some points for that accent please. For all the praise, there is naturally criticism. The movie never breaks free of the fact that it’s a play. It has “Play” written all over it from beginning to end, so much so, you might wonder what the point of making this movie was. The script requires a suspension of disbelief not so readily found in a general cinema audience. The performances are, at times, very theatrical to the extent that the screen makes them over-the-top big. Granted, “God of Carnage” probably isn’t playing on a stage in your town right now, but if it were I’d tell you to go see that. The film is reminiscent of Hitchcock’s Rope, you absolutely know what he’s going for, but he never quite gets there. Like Rope, this is absolutely worth seeing, but it does miss the target. Straight filming of plays doesn’t sit well with audiences, but if you can’t make up your mind whether to go see a film or a play, check out Carnage. Check it out either way. If you don’t like it, come find me.